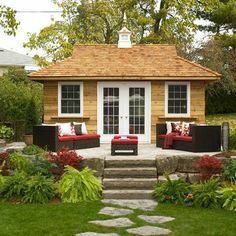 A garden suite is a legal, detached, ground-oriented suite located in the backyard of a property with a single-family home as its primary use. The City of Colwood allows for garden suites up to 645 square feet (or 40% of the gross floor area of the existing home, whichever is less). Creating a garden suite is another option for introducing a rental suite or in-law accommodation on your property where a secondary suite does not already exist. Property owners may convert an existing accessory building if it meets policy guidelines, or build something new. Garden Suites must go through an application process for approval. Talk to Development Services staff at 250-478-5999 to confirm that your property is suitable for a garden suite and to discuss what the requirements are. They can review the Secondary Suite Checklist with you and direct you other key contacts in the City to move forward with a Building Permit. More information about the requirements around garden suites can be found in the Colwood Land Use Bylaw, where they are referred to as Accessory Dwelling Units.